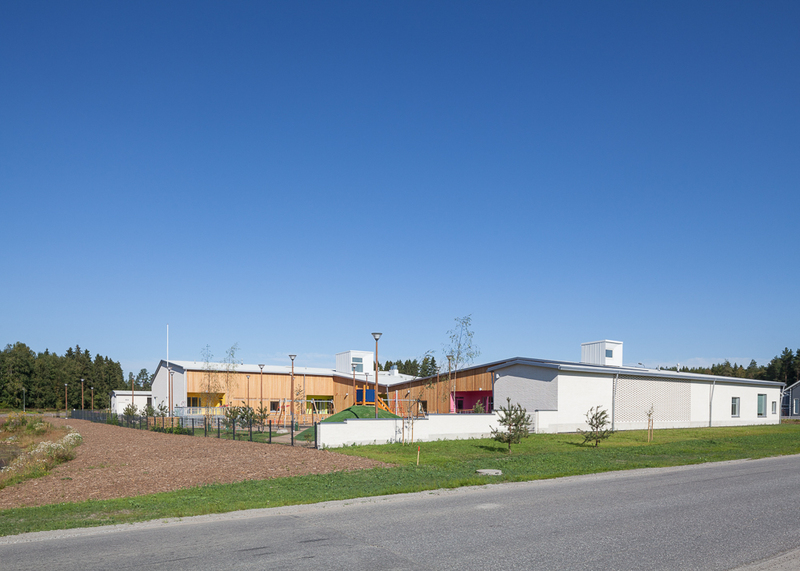 The new Ulkometsä daycare center in Rytimäki, Kokkola is an experiential and friendly space specifically designed with the needs of children in mind. 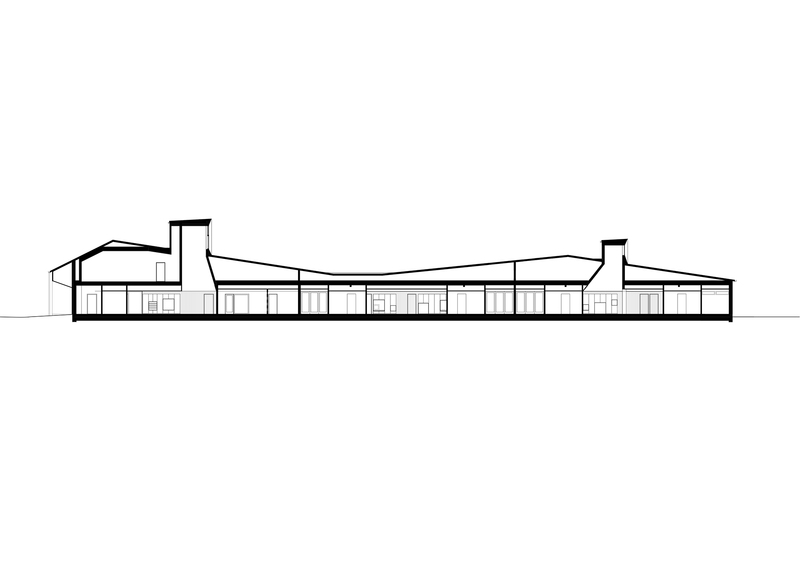 With its pitched roof the building forms an identifying landmark in the newly built area. However, it also sensitively respects the scale of the surrounding residential buildings. On the side facing the street the façade is of simple and slightly rough white slammed brick. 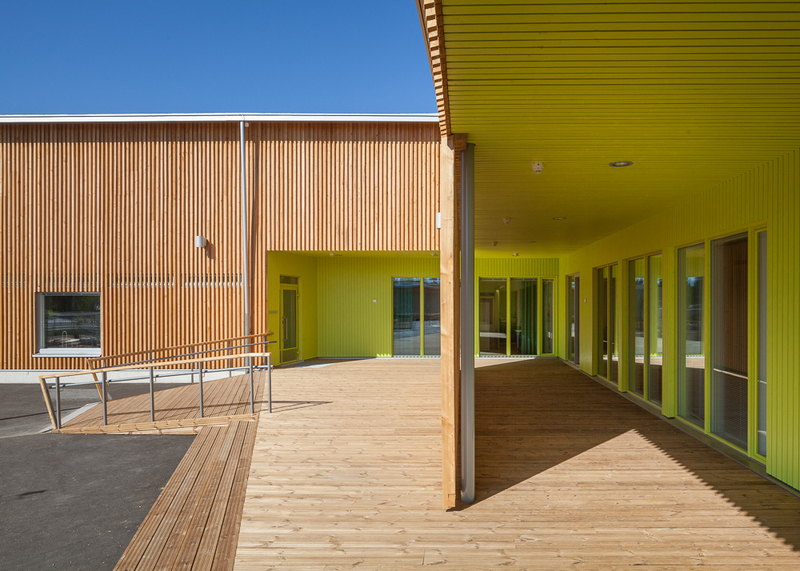 In contrast, the façade on the courtyard side is of untreated larch giving it a sense of warmth. 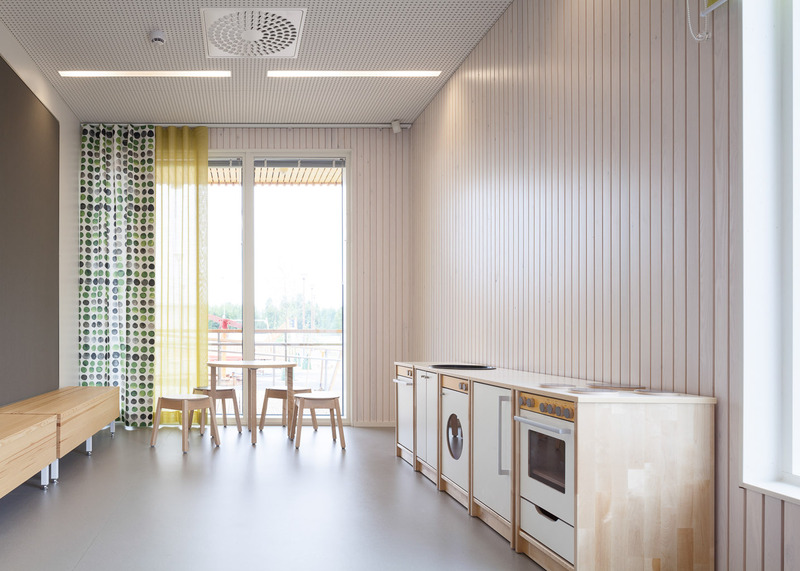 The colorfully framed windows and entrances, color-coded so that each age group has its own identifiable color and its own section of the building, emphasize the functional character of the building as a space for children. The same color theme continues in the interior spaces. 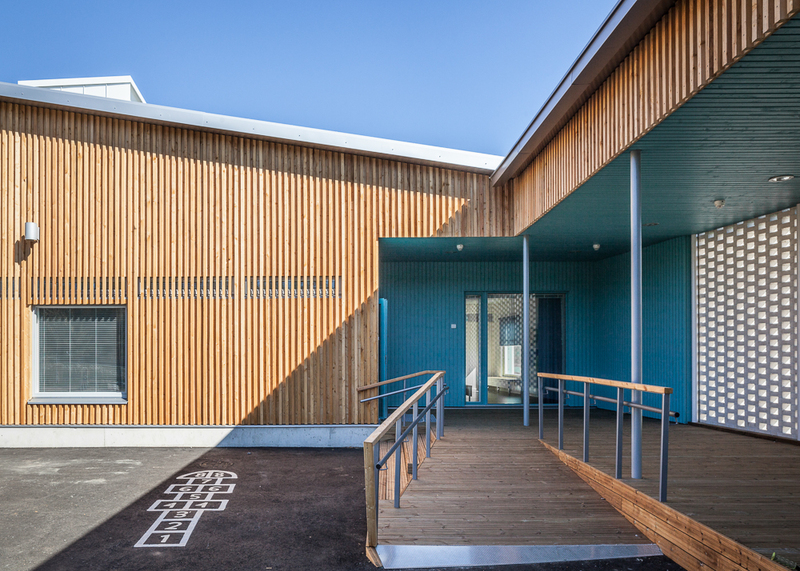 The U-shaped form of the building forms a protective shelter for the children’s playground in the interior courtyard. The courtyard opens up to a green meadow in the southwest. One can enter the building either through the main door conveniently located near the parking area or through the sheltered wooden entrance porches in the courtyard side. One can bring the children in through the main entrance in the morning and then pick them up in the playground at the end of the day in the afternoon. 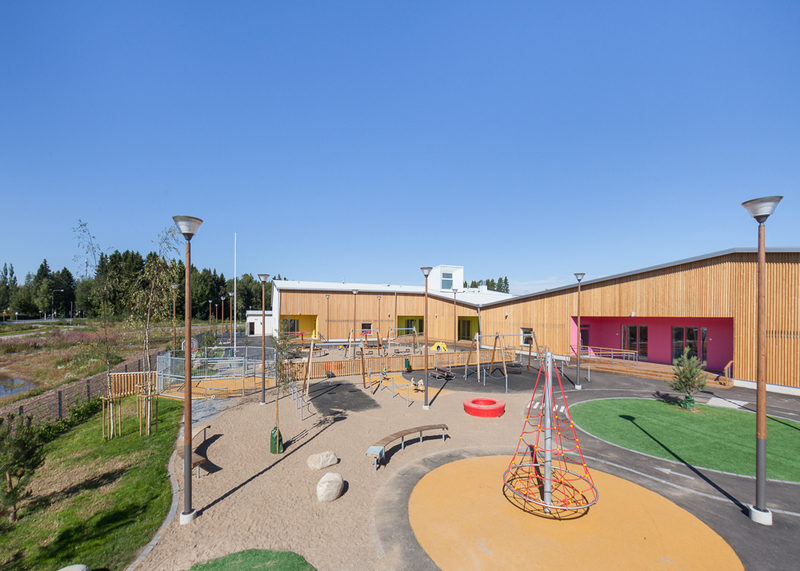 The porches also serve as covered outdoor play areas in rainy weather facilitating the common practice in Finland of spending time outdoors during the day regardless of weather. Each entrance porch is shared by two groups and provided with a functionally organized foyer that is intentionally designed to meet even the most challenging needs of the fall and winter season. In a practical manner they are equipped for treating and hanging the outdoor clothing and boots. 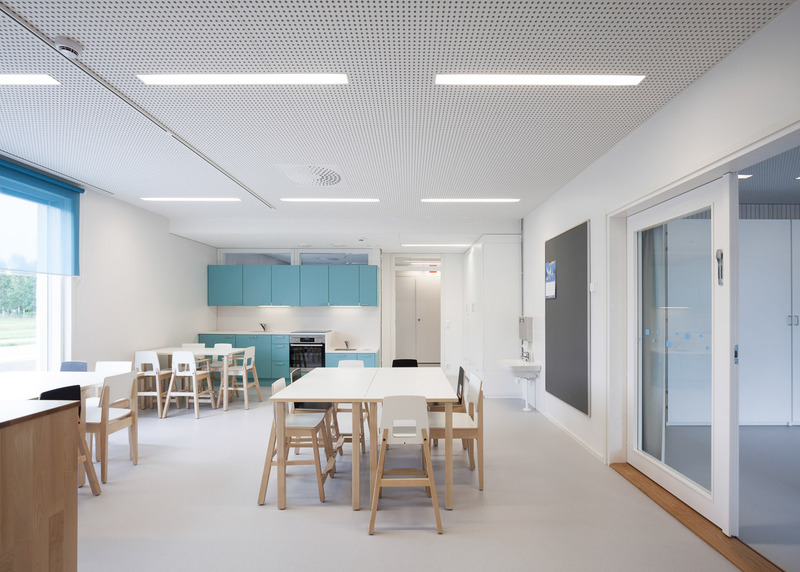 The spaces in the building are divided into independent home unit areas that each house two groups of children. There are altogether three home unit areas, two at each end of the long spur-like part of the building and one in the short one. The home unit areas have large windows facing the yard and giving the building lots of light and air. The areas for different age groups are marked each with their own color and the space is arranged with a child’s perspective in mind. 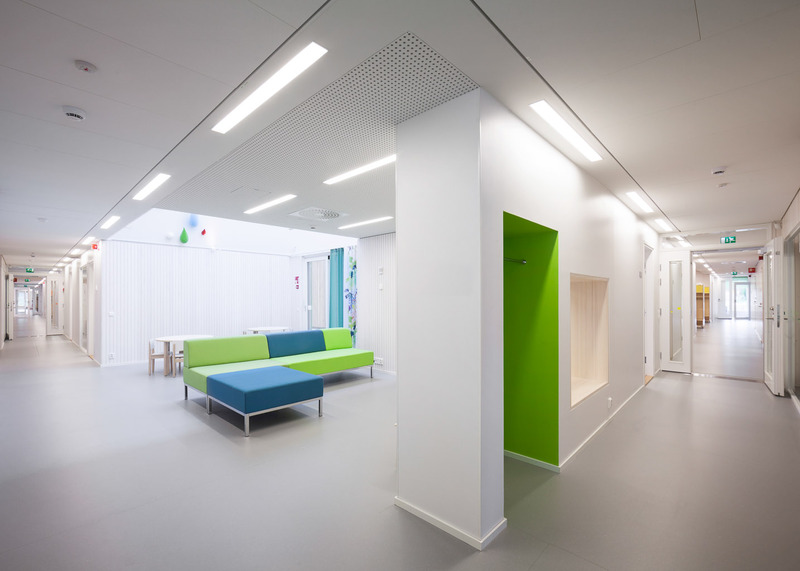 The space is organized in a playful rhythm of alternating sheltered nooks and open areas. 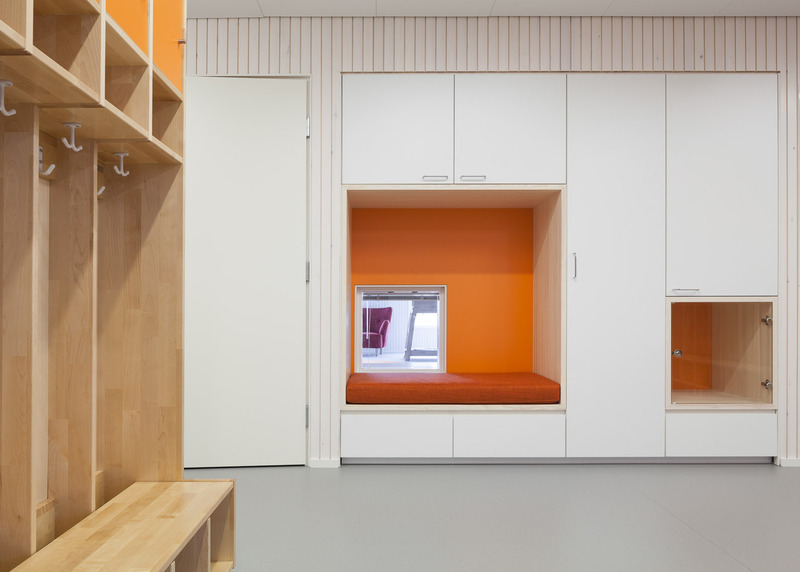 Freestanding closets provide space for storing supplies while also serving to create organization in the central space that is otherwise left open. 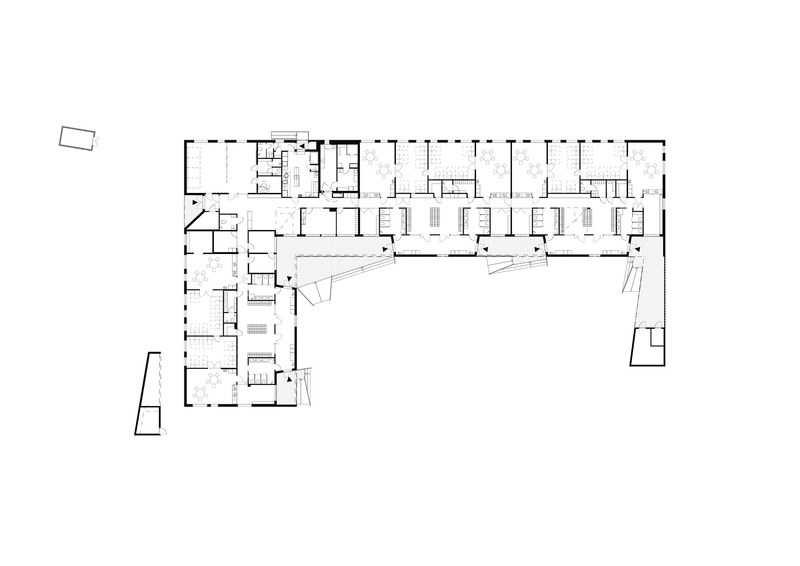 The main spaces for each group are located on the street side of the building along with the nap rooms and the group work areas that are separated from each other by wide double doors. 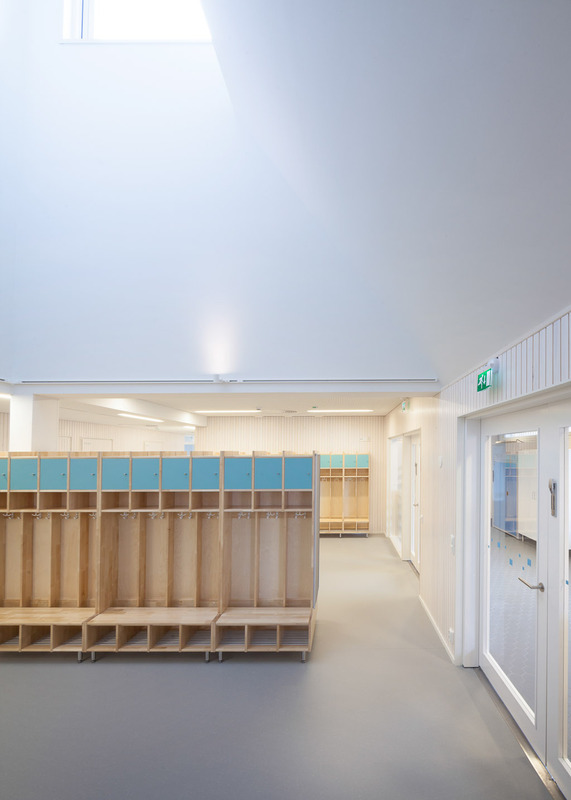 The spaces for the staff as well as a storage room shared by two groups are placed in between the home unit areas for the two groups. As a spine that goes through the building there is a common hallway connecting the different home unit areas. Each group has its own ‘activity wall’ giving the children added space for play by providing islands of play space and seating areas. 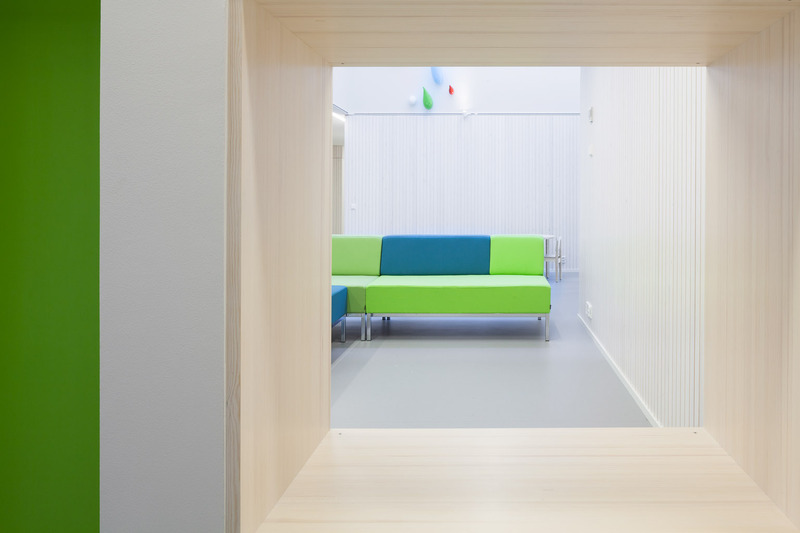 In the ‘activity wall’ there are also small windows that allow one to peak into the nap rooms, as well as bookshelves, vitrines for placing things on view and surfaces where it is possible to hang the children’s drawings. At the end of the hallway there is a reading corner for story time opening into the yard through a large window with a windowsill wide enough to provide a space for reading and play. Also the lobby area in conjunction with the main entrance offers ample space for play and for hanging around. 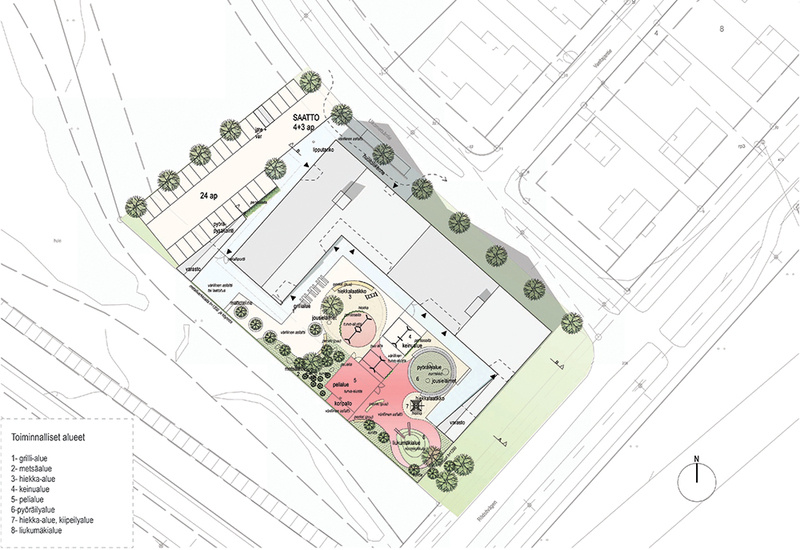 Through the main entrance there is direct access to the offices, the kitchen, as well as a larger hall that can function as a meeting space for the community in the evening hours and during weekends while serving as a gym space for the children during the day. The daycare center accommodates 144 children.